A study of Lake Panasoffkee and the surrounding watershed was conducted between October 2005 and September 2009 to gain a better understanding of how this large lake fits within the regional hydrogeologic setting of west-central Florida. Lake Panasoffkee is part of the headwaters of the Withlacoochee River and has a major influence on the hydrology and ecology of that basin. The study defined the interaction between surface water and groundwater, and the magnitude of lake evaporation and groundwater inflow to the lake and how these relate to the Lake Panasoffkee water budget. Geochemical and isotopic analyses were used with water-budget results to describe water sources for the lake. Lake Panasoffkee, the underlying surficial aquifer, and the Floridan aquifer system are hydraulically connected. An area of focused groundwater-discharge potential, where groundwater levels are higher than surface-water levels, is present beneath Lake Panasoffkee and extends several miles northwest and southeast of the lake. Although the size and intensity of the discharge area varied with the seasons and with hydrologic conditions, discharging conditions remained constant throughout the study period. The sandy uplands farther northeast and southeast of Lake Panasoffkee showed the greatest potential for surface-water to groundwater recharge within the study area. The Lake Panasoffkee watershed lacks a well-developed surface-water drainage system because rainfall rapidly infiltrates the sandy soils in the uplands and recharges the surficial aquifer. The intermediate confining unit is discontinuous in the study area, but even in areas where the confining unit is present, there is a well-developed internal drainage system that compromises the integrity of the unit. The internal drainage system consists of an interconnected network of karst features that includes sinkholes, fissures, and conduits. The discontinuous intermediate confining unit and internal drainage features allow the surficial aquifer to rapidly recharge the Upper Floridan aquifer in recharge areas. Little Jones Creek and Shady Brook were the primary contributors of surface-water flow to Lake Panasoffkee during the study period. The average monthly discharge from Little Jones Creek to Lake Panasoffkee ranged from 6.56 cubic feet per second in June 2007 to 75.8 cubic feet per second in August 2008, whereas the contribution of Shady Brook to Lake Panasoffkee ranged from 8.28 cubic feet per second in June 2007 to 59.6 cubic feet per second in September 2008. The combined flow from both tributaries accounted for 51 and 47 percent of total input from all sources during water years 2007 and 2008, respectively. The U.S. Geological Survey water year begins October 1st and ends September 30th. Water-budget calculations indicated that Lake Panasoffkee received 29 percent of its total inflow as groundwater inflow during the study period. Groundwater inflow is defined as diffuse flow (or discharge) from the groundwater system to Lake Panasoffkee through the lakebed. Monthly groundwater inflow to Lake Panasoffkee ranged from 11 to 50 percent of total inflow during the 2-year data-collection period, excluding 2 months when groundwater inflow was negligible. Comparatively, the volume of surface-water inflow for the 2-year data-collection period was 50 percent of the total inflow, and rainfall accounted for 21 percent. Lake Panasoffkee lost 21 percent of its outflow through evaporation and 79 percent through surface-water outflow. The percentage of total inflow received by Lake Panasoffkee from groundwater is not unusual among central Florida lakes, but the source and volume are atypical. A previous U.S. Geological Survey study showed that most lakes in central Florida receive groundwater inflow from the surficial aquifer, but Lake Panasoffkee primarily receives groundwater inflow from the Upper Floridan aquifer. The large volume of groundwater inflow also is unusual for a lake the size of Panasoffkee, which received 1.4 billion cubic feet of groundwater inflow in water year 2008. In addition, the groundwater flow system also is the source of much of the surface-water flow to Lake Panasoffkee. Four synoptic streamflow measurements completed between December 2007 and September 2008 determined that 60 to 78 percent of the total surface-water inflow to Lake Panasoffkee during baseflow conditions originated from spring discharge. The Floridan aquifer system contributes water to, and interacts with, the surface-water system and the surficial aquifer in the Lake Panasoffkee watershed. In the study area, the Floridan aquifer system consists of the Upper Floridan aquifer and the Lower Floridan aquifer, separated by two confining units, middle confining unit I and middle confining unit II. The distribution of the two middle confining units has substantial effect on the availability of potable groundwater in the study area. Middle confining unit I is shallower and leaky and found mostly east of the lake. Middle confining unit II is deeper, less permeable, and found mostly west of the lake. Both confining units are found south of the lake. Water samples were collected in July 2007 and December 2008 through January 2009 from Lake Panasoffkee, selected tributaries and springs that flow into Lake Panasoffkee, and groundwater wells installed in the surficial, Upper Floridan, and Lower Floridan aquifers in the Lake Panasoffkee watershed. Every water sample collected in the study area was classified either as a calcium-bicarbonate, calcium-sulfate, or mixed calcium-bicarbonate/calcium-sulfate water type. Calcium-bicarbonate type waters form where groundwater dissolves the carbonate limestone of the shallow Upper Floridan aquifer. Calcium-sulfate type waters form through the dissolution of the mineral gypsum; geochemical mass-balance modeling performed in a previous U.S. Geological Survey study of the area indicated that the source of the gypsum (and the high sulfate water) is likely found near the base of the Upper Floridan aquifer. The mixed-water type is found in areas where the calcium-sulfate type water upwells from this unit into the shallow Upper Floridan aquifer, where it mixes with calcium-bicarbonate type water. The calcium-sulfate and mixed calcium-bicarbonate/calcium-sulfate type waters were found in samples from Lake Panasoffkee and from the groundwater system south and southwest of Lake Panasoffkee during the 2007 sampling event, but were only found in samples from the groundwater system during the 2008-09 sampling event. The latter sampling event followed a wet period when surface-water levels were higher and aquifer levels in the surficial and Upper Floridan aquifers had recovered slightly from earlier severe drought conditions. 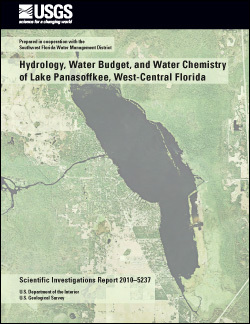 McBride, W.S., Bellino, J.C., and Swancar, Amy, 2011, Hydrology, water budget, and water chemistry of Lake Panasoffkee, west-central Florida: U.S. Geological Survey Scientific Investigations Report 2010–5237, 96 p.